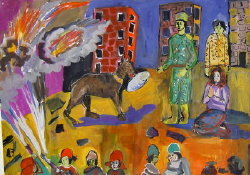 Click here to read about the Artworks Armenia Project. 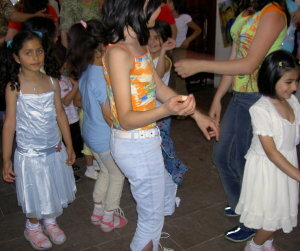 Click here to read about the logistics of staging the Children of Gyumri art show. 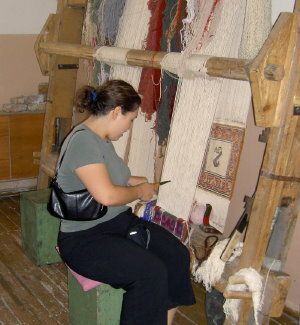 School Director Susanna Mkrtchyan addresses the visitors in the dance studio. 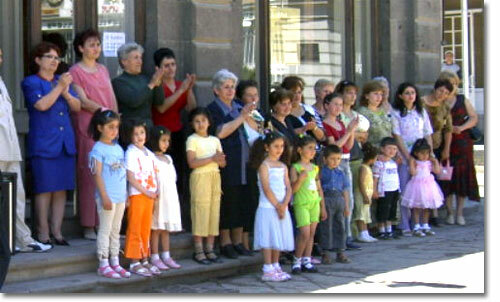 Staff, Relatives, and Students of the Aesthetic Educational Center of Gyumri watch and keep time as older students perform a welcoming dance for Birthright Armenia visitors. 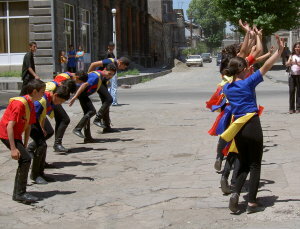 We were greeted on our arrival by a dance group of students performing a traditional folk dance on the pavement in front of the Gyumri school and orphanage. 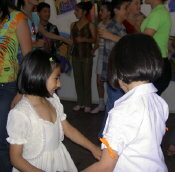 Their bright-colored costumes were fashioned at the school in the national hues. 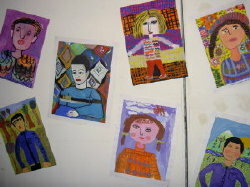 After the festive welcome we went into the school for a tour of the school and its galleries. Older students performing a welcoming, traditional folk dance for Birthright Armenia visitors dance group of students. 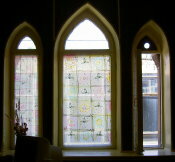 Delicate hand-painted curtains on the arched windows of the school’s second story dance studio. 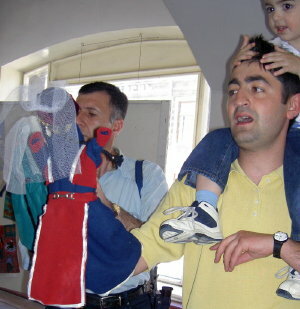 Puppet shows are a mainstay of the children’s entertainment. 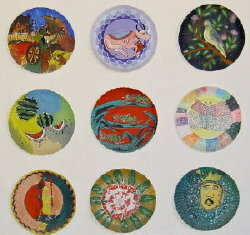 Painted paper plates on display in the downstairs school gallery. After the tour the music started up again and everyone danced.